Featuring a higher clamping load than our STR series, OS Giken competition twin-plate clutches are designed specifically for racing applications including drag racing. Power handling capacity varies according to the specific model. As a general guide A-size clutches are recommended for up to 450hp, B-size for up to 550hp and C-size for up to 650hp, however power handling will vary up or down depending on the torque characteristics of your engine. 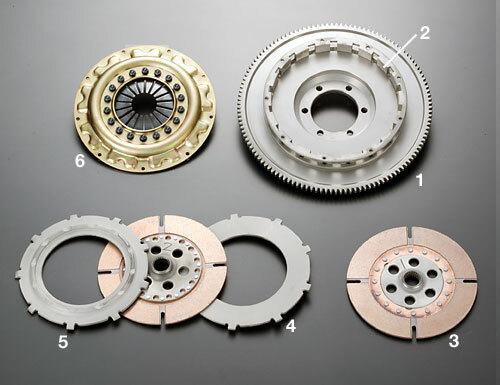 Please contact us to check if these clutches will suit your application. Each clutch comes with a lightweight chrome-moly flywheel and the required bearing/carrier set or pull-push converter kit where required.